YELLOWSTONE NATIONAL PARK, WY -- Tourist John Gleason crept through the grass, four small children close behind, inching toward a bull elk with antlers like small trees at the edge of a meadow in Yellowstone National Park. The elk's ears then pricked up, and it eyed the children and Washington state man before leaping up a hillside. Other tourists - likewise ignoring rules to keep 25 yards from wildlife - picked up the pursuit, snapping pictures as they pressed forward and forced the animal into headlong retreat. These transgressions add to rangers' growing workload that includes traffic violations, searches for missing hikers and pets running off-leash in parks. "It's more like going to a carnival. If you look at the cumulative impacts, the trends are not good," said Susan Clark, a Yale University professor of wildlife ecology who has been conducting research in the Yellowstone area for 48 years. "The basic question is, 'What is the appropriate relationship with humans and nature?' We as a society have not been clear about what that ought to be, and so it's really, really messy and nasty." - A Canadian tourist who put a bison calf in his SUV hoping to save it, ending with wildlife workers euthanizing the animal when they could not reunite it with its herd. - Three visitors from Asia cited on separate occasions for illegally collecting water from the park's thermal features. - A Washington state man killed after leaving a designated boardwalk and falling into a near-boiling hot spring. 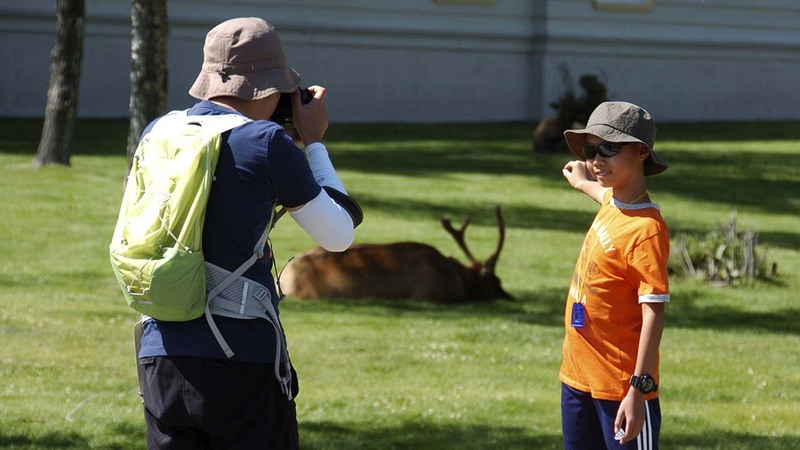 Washington state resident Lisa Morrow's son was among the children Gleason led toward the elk. Despite safety advisories - and numerous examples of visitors getting gored by bison, mauled by bears and chased by elk - Morrow declared herself unafraid of the park's wildlife. She said she was eager to see a grizzly up close. "You take a picture of yourself standing 10 feet in front of a bison, and all of a sudden a few hundred people see it, and it's reposted - at the same time we're telling everybody wildlife is dangerous," Wenk said. "They get incongruous messages and then it happens. They get too close, and the bison charges."